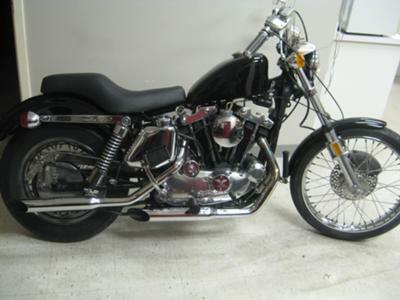 This is a super clean 1973 Harley Sportster XLCH for Sale. It's a 1000 Custom model that has had every inch detailed to perfection. Every inch of this bike is great from the fresh black paint to the the motorcycle seat that has been re-done as you can see from the picture . Everything on this 1973 Harley Davidson Sportster is working and in tip top shape. You will find no rust on this restoration. The bike has Andrews cams, a crane ignition system with electric start, accel wires, oil cooler and lots of upgraded chrome parts. If you wanted to, you can eat off this bike. Leave a way for me to contact you in the comments form that Strike Lightning's GoGoCycles Used Motorcycles for Sale has provided below this ad. My asking price for the 1973 Harley Sportster XLCH for sale is $5500.00 and I'm open to offers. Is the 73 XLCH still for sale? What state are you located? nice. I've got the same bike...hasn't been ridden in years. i need replacement tires. any suggestions. would really appreciate it.